Father Andrew Burnham, former Anglican Bishop of Ebbsfleet, celebrated his First Mass in our church on Sunday, having been ordained priest by Archbishop Vincent Nichols in Westminster Cathedral the day before, along with two other former Anglican bishops who have joined the 'Ordinariate' set up by Pope Benedict. 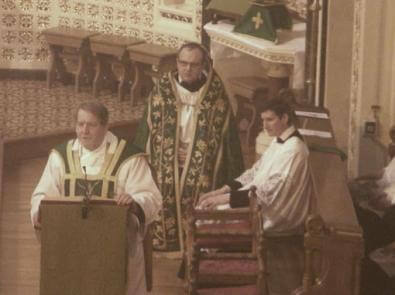 Father Andrew was assisted at the altar by Father Robert. 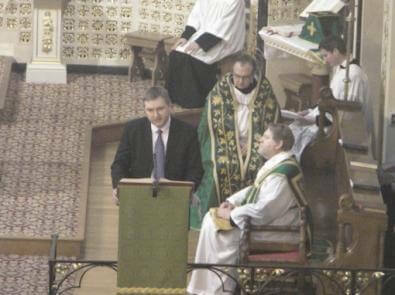 Fr Aidan Nichols, OP preached the sermon, which is reproduced below. We are, at this Mass, on a cusp, or boundary, or threshold. What I have in mind is in the first place the ritual calendar we're using. We are on the cusp between, on the one hand, the Christmas season, which celebrates the Theophany, the manifestation of God the Word as a human being to other human beings, and, on the other hand, so-called 'Ordinary Time', a time which is far from ordinary because it consists in the telling of his story, the story of the public ministry of the Christ as it unfolds in all its dramatic action. Appropriately, then, today's Gospel-reading points both backwards and forwards, and its key is the identification of Jesus as the 'Lamb of God'. Twice, actually, within a few verses of the Fourth Gospel, when the Baptist wants to identify who Jesus is, to locate him (so to say) on the map of salvation geography, these are the words he comes up with. The best explanation of that, I think, is that John the Baptist is rehearsing what it was his cousin told him. At the Baptism, the heavens were opened for Jesus, and in the open heavens he saw… well, what did he see? He saw himself as the Lamb, sent by the Father to make the atoning sacrifice which will reconcile to the Father Israel and all the world, and bring humankind home to the Father's house. Jesus would go on to comport himself in just this fashion in his public ministry, in the strength of the Holy Spirit whose descent on him in the form of a dove verified what it was, in the opened heavens, that he saw. The Lamb of God: that is the One we follow, it is how the God-man wishes to be known and loved. He came to make sacrifice for us. That is the impetus that drives his ministry forward till it reaches its climax in the Paschal Mystery of his Death and Resurrection. It is the attitude in which he still stands before the Father, showing the marks of his now glorious wounds. 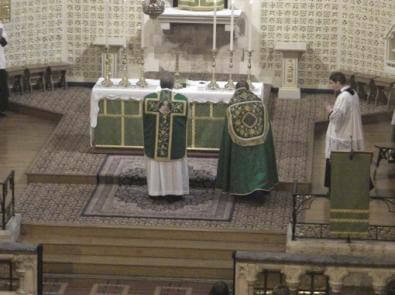 And it is why the continuing sign of that sacrifice – the Mass – is the true centre of the Christian religion. 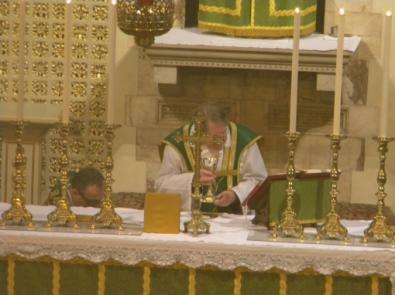 In the Eucharistic sacrifice, we bring ourselves – all we do and are, all we have done and have been – to be, through purification and transformation, united with the Lamb, Jesus Christ, in his self-offering to the Father. All we did and do, all we have been and are, our life and labour, we should put (so the spiritual writers advise) onto the paten, into the chalice. Bishop Andrew – I've known Andrew so long and closely under that description I find it hard to break the habit – is celebrating today his first Mass in full union with the Catholic Church. What does this offering of the gifts mean, then, for him? What is said of the life and labour of any Christian is said with special force of the apostolic life and labour of an ordained person. 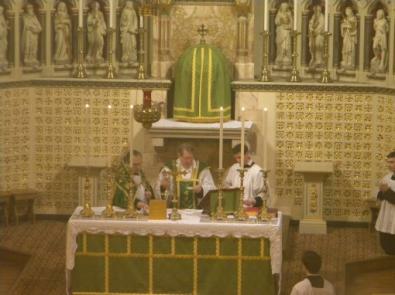 'What we did and do, what we have been and are': all Andrew’s former ministerial activity, inevitably, is signalled is these words and so it is now taken up into union with the Lamb's oblation of himself, taken up in a new way as the sacrificial offering of a Catholic priest in the full, unclouded, indisputable, sense of those words. What he has done, what he has been: as with all of us, that must mean the faults and failings from whose weight we ask to be relieved through this renewal of the Lamb's oblation. But is also means the grace-supported actions which we join to the Lamb's offering not for purification but for further enhancement. In the spring of 1843, Newman wrote to a correspondent, 'At present… as far as I can analyze my convictions, I consider the Roman Church Communion to be the Church of the Apostles, and that what grace is among us… is extraordinary, and from the overflowing of His dispensation.' I've left out in this citation a phrase in parenthesis for the sake of drawing attention to it now – 'what grace is among us (which, through God's mercy, is not little)'. 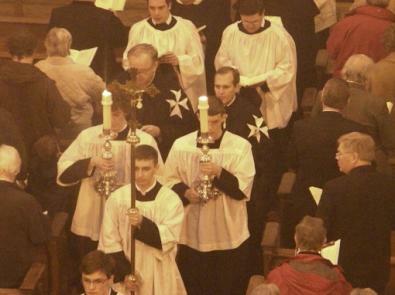 The task before Andrew and the others in the Ordinariate of our Lady of Walsingham is to translate into terms of Christian life, thought and worship, what that 'not little' grace has done, in the history of the Church of England – what it is that can be placed on the paten, put into the chalice, not for propitiation, in a spirit of repentance, but for the praise of God’s glory, in a spirit of thanksgiving. And this is the second sense in which we stand now on a cusp or boundary or threshold. 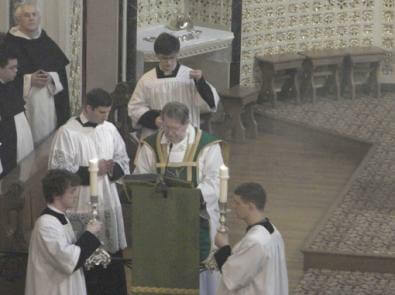 We rejoice today for Andrew personally as a long odyssey is completed, but since no share in priesthood is ever conferred for the individual's satisfaction but only for some wider good, we also have to draw attention to the task that awaits him. Newman spoke of the 'concentration and adjustment of great Anglican authorities'. Andrew has already begun working on the liturgical dimension of this, entrusted by the Holy See with co-ordinating efforts on that front, in recognition of his outstanding competence in that area. But there is more than that. 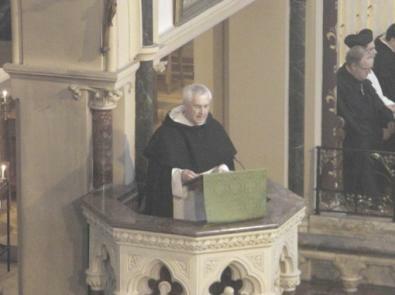 There is bringing this new ecclesia particularis, this new 'particular church', into the movement for renovating the whole Church which we associate with the mind and heart of Pope Benedict, a movement which respects the Second Vatican Council but places it, by a hermeneutic of continuity, in the great Tradition as a whole. It is a movement towards the fullness of Catholicity, in which the fathers of the Oxford Movement can take effortlessly their place. So, Father, let me leave you and this congregation with one final citation from the Blessed John Henry, 'I have a work to do in England'.